Launched in 2005, TechCrunch is a blog dedicated to covering all things web: software, gadgets, start-up, geek, venture capital, and more as long as it’s techie and it generates pageviews. Originally independent, TechCrunch was acquired by AOL in 2010. Its numbers are impressive: it attracts 12-plus million unique visitors a month that generate 53-plus million pageviews on top of the 2.2-plus million RSS subscribers. Along with sister (yet rival) AOL site, Engadget, they pretty much rule tech journalism. On Monday, TechCrunch unveiled a redesigned website and identity by New York-based Code and Theory. The new logo is our most controversial change. I love it, though that’s no accident: we went through many, many options with Code & Theory before finding one we liked. It’s bold, simple, and versatile. It works in any context — from a tiny monochrome icon to a mosaic on a poster. It fits the TechCrunch brand perfectly. […] It’s the first and only design Heather, Mike and I looked at and said yeah, that’s it. It screams TechCrunch. The old logo was obviously a non-logo. I wouldn’t even grant it wordmark status, although technically it is. But, no matter, it’s gone. Now sporting an official logo, TechCrunch seems pretty gung-ho about it and has preemptively decided that its readers are not going to like it: The blog post announcing the new design is titled “Redesigning TechCrunch: We Picked This Logo Just to Piss You Off”. After more than 316 comments people mostly do seem to be pissed off, not so much by the logo as by the overall look. Indeed, the logo is nothing to get pissed off about. It’s actually a rather nice monogram that instantly, if perhaps in a clichéd way, says “tech”. And even if we all agree that no one should use bitmaps to indicate tech because it’s both a lazy concept and antiquated notion of what technology is in 2011, the blocky “TC” isn’t piss-off-worthy. The problem is the execution and implementation. It’s completely unimaginative and even quite amateurish. The logo in perspective shown above? Ugh. That’s the first thing any design student would try if tasked with doing a logo for a blog about technology. And the pixels within pixels as seen in the variation next to it? Somewhat pretty but that’s about it. And pairing it all with Interstate? For some reason it does not work at all even though it probably should; it looks like a remnant of early 2000s design. Nonetheless, the overall effect of the design of the logo and website matches TechCrunch: it’s intense, bold, and in your face. So it works. But it would have been nice to see less repetition of visual tech tropes and more innovation, the kind TechCrunch is so infatuated about blogging. 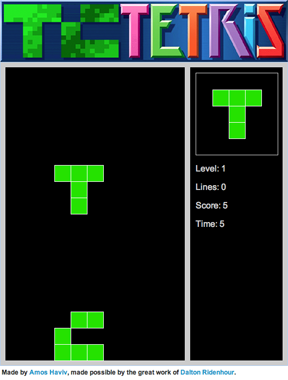 Bonus: a working version of Tetris with only the “T” and “C” of the new logo as pieces. Launched in 2005, TechCrunch is a blog dedicated to covering all things web: software, gadgets, start-up, geek, venture capital, and more as long as it's techie and it generates pageviews. Originally independent, TechCrunch was acquired by AOL in 2010. Its numbers are impressive: it attracts 12-plus million unique visitors a month that generate 53-plus million pageviews on top of the 2.2-plus million RSS subscribers. Along with sister (yet rival) AOL site, Engadget, they pretty much rule tech journalism. On Monday, TechCrunch unveiled a redesigned website and identity by New York-based Code and Theory.